Bob Menendez’s federal criminal corruption charges: The New Jersey senator’s case isn’t a part of the state’s political culture. It’s fun to joke about Soprano State corruption, but Sen. Bob Menendez’s case offers lessons that are bigger than New Jersey. 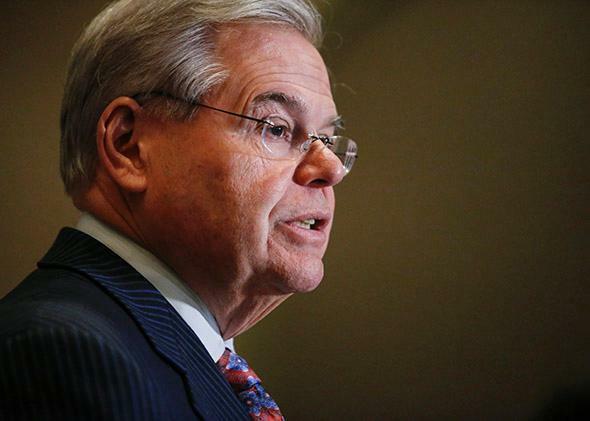 Sen. Bob Menendez speaks at a press conference on March 6, 2015, in Newark, New Jersey. No sooner had news surfaced on Friday that federal prosecutors were on the verge of bringing criminal charges against New Jersey’s Democratic Sen. Bob Menendez than the jokes about the Soprano State’s culture of corruption began. Heck, even I couldn’t resist. On further reflection, though, we’re being unfair to ascribe the Menendez mess entirely to the state from whence he came—and in so doing are missing lessons about how to safeguard our political system from further such occurrences. The precise nature of the charges against Menendez aren’t yet known, but for two years the feds have been scrutinizing his dealings with a wealthy South Florida ophthalmologist named Salomon Melgen. Menendez, the child of poor Cuban immigrants, got to know the Dominican-born Melgen two decades ago, back when Menendez was a new arrival in the House of Representatives, and has, by his own account, become close friends with him. In recent years, Menendez repeatedly interceded on Melgen’s behalf in a dispute with the Centers for Medicare and Medicaid Services over allegations that Melgen had overbilled Medicare for millions of dollars for injections he was performing on patients with macular degeneration. Menendez has also been pressing on Melgen’s behalf to help him see through a deal he has to sell port-screening equipment to the Dominican government. Meanwhile, Melgen has been a highly generous supporter of Menendez’s. He and his family gave $33,700 to Menendez’s 2012 re-election campaign, as well as $60,400 to the Democratic Senatorial Campaign Committee while Menendez served as its chairman during the 2010 election cycle. But the biggest contribution by far was a series of three payments totaling $700,000 that Melgen’s business gave in 2012 to Majority PAC, a Democratic super PAC that in turn shoveled nearly $600,000 toward Menendez’s re-election that year. Melgen also paid for two free trips that Menendez took in 2010 to Melgen’s seaside mansion in the Dominican Republic, a gift that Menendez did not initially disclose and for which he later paid $58,500 in reimbursement. Regardless, the case represents a major comedown for Menendez, who—after being raised by a seamstress and a carpenter with a gambling problem who killed himself when Menendez was in his 20s—made his name as a rising young politician by standing against New Jersey corruption. At age 27, he took the stand to testify against his mentor, Union City Mayor William Musto, who was convicted of racketeering for steering school money to mobsters. (Given the players involved, Menendez had to wear a bulletproof vest for the occasion.) He went on become Union City mayor himself, then state assemblyman and finally a congressman in 1992 before ascending to the Senate in 2006, all the while transforming the Hudson County Democratic machine from its white-ethnic roots to reflect the county’s increasingly Hispanic face. But that doesn’t mean there aren’t lessons for the rest of us. Consider, for one thing, the exact nature of Menendez’s biggest intervention on behalf of Melgen (who, let’s not forget, was himself a resident of Soprano State): Medicare billing. One of the most glaring idiosyncrasies of the U.S. health care system is that it leaves a significant role to play for members of Congress when it comes to determining payment levels for Medicare and Medicaid—either in the form of legislation or ad-hoc interventions like this one. The whole arrangement is great for health industry lobbyists and campaign accounts but not so great for the rational operation of our health care system. As it happens, the Affordable Care Act addresses this weakness by leaving more of the payment decisions in the hands of an independent board of technocrats, but many in Congress have been resistant to ceding their authority. Or consider one of the likely motivations for Menendez to accept the trips to Melgen’s Dominican mansion. It’s not hard to imagine why a son of the tenements would want to hobnob in luxury—and it’s even easier to imagine when one considers that Menendez is surrounded in the Senate by multimillionaires who live at a level he can only dream of. The median net worth for all senators last year was $2.7 million. Whereas Menendez, one of the chamber’s poorest members, gave up a goodly portion of his net worth when he cut the $58,500 check to reimburse Melgen for the free flights. Our absurdly unrepresentative Congress does not excuse the acceptance of freebies by the regular Joes left in the mix, but it helps explain how they come to accept them. Granted, all the above circumstances have not kept plenty of our elected officials from hewing to the straight and narrow. But no, this isn’t just a Jersey thing. Take, for a final counter-example, the ambitious politico-in-the-making who, like Menendez, intervened on behalf of a major political donor who was in his own dispute with federal health regulators, in this case over the ratio of Medicare patients that the donor’s medical centers could handle. In that case, the businessman in question even wrote a $75,000 check to the rising politico’s real-estate firm—and ended up fleeing the country and being sought for years on charges of defrauding Medicare for hundreds of millions of dollars. That case wasn’t in New Jersey—it was in Florida. And the person who made the calls to regulators on behalf of the donor? A current leading candidate for president: Jeb Bush.